This page is for those interested in how we use 3D construction models to illustrate our books. 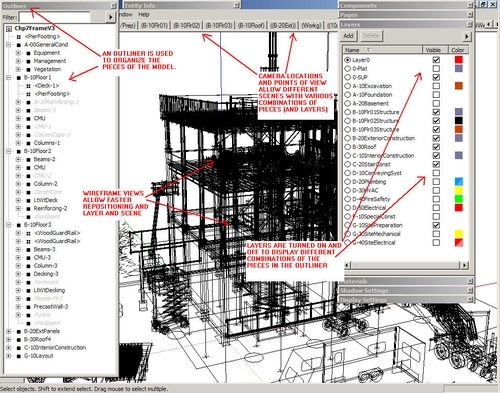 The method comes from research on how construction managers might use 3D models to communicate assemblies, sequences, and techniques for a more collaborative approach to their projects. The idea is to translate images or screenshots of 3D construction models to visually support reports, proposals, and presentations. Each piece in a construction model is built to operate at full scale and exact dimensions. Equipment models quickly add to the value of a construction model. They give the model a visual scale, represent the relative size of the equipment in the model, and add visual accuracy to a model simulation. 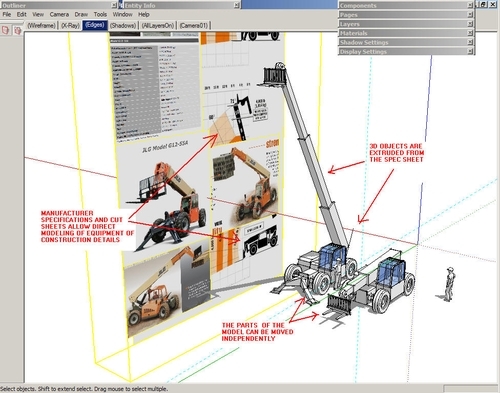 Construction models are organized to visually display different combinations of information. We use a combination Layers and the Outliner in SketchUp. This means WBS phases or sequences of any operation are accurately represented using the same construction model. 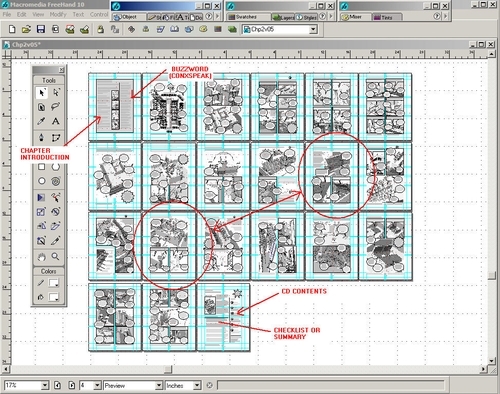 2D design details are shown in the context and sequence of their construction in the model. This means the model pieces can be extracted directly from the construction documents. The resulting model acts as a three-dimensional index to the relevant two-dimensional construction documents. 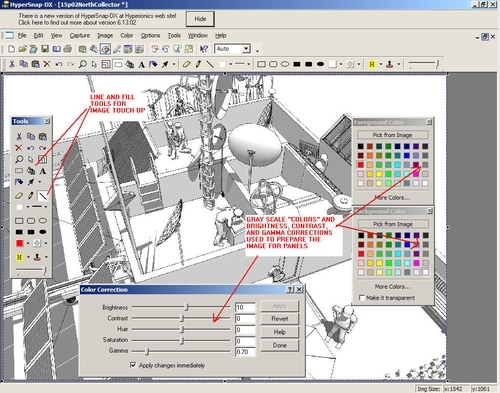 Scenes are captured from the 3D models using the Export 2D feature where they can be edited and annotated in programs like PowerPoint, Word, and PhotoShop. We use HyperSnap, a simple image editor that does most of what PhotoShop will do without the steep learning curve. 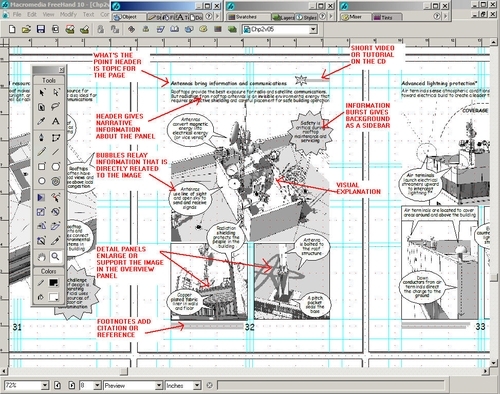 Once the illustrations have been edited, they are imported into a publishing program like FreeHand MX or Adobe’s InDesign where layers of information are added as captions, text bubbles, and references to the videos (on our books’ CD’s). 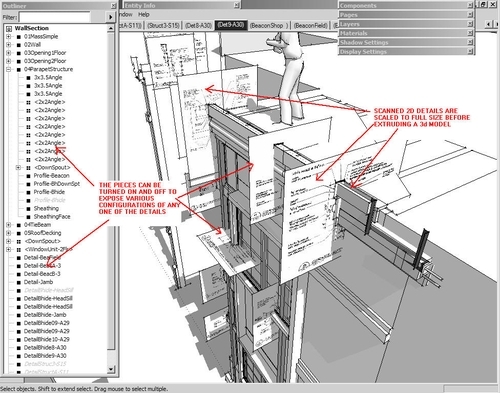 Unlike a design, or building information model, construction models represent dynamic and sequential processes that must be captured on the panels and pages of our books. Construction information is thereby animated as the underlying motion and time embedded in the 3D construction model is translated onto each two-dimensional page. very good article. It help me to move ahead in my learning process. Hi, I have used Sketch Up a little, however your site is excellent, I have developed training material for telehandlers, elevating workplatforms and forklifts, having graphics to demonstrate a particular point is ideal but hard to make. a lot more photos it would be possibly even far better.